his text presents a comprehensive treatment of signal processing and linear systems suitable for juniors and seniors in electrical engineering. 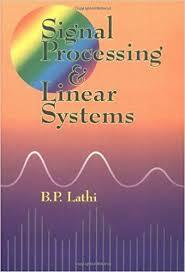 Based on B. P. Lathi's widely used book, Linear Systems and Signals, it features additional applications to communications, controls, and filtering as well as new chapters on analog and digital filters and digital signal processing. Lathi emphasizes the physical appreciation of concepts rather than the mere mathematical manipulation of symbols. Avoiding the tendency to treat engineering as a branch of applied mathematics, he uses mathematics to enhance physical and intuitive understanding of concepts, instead of employing it only to prove axiomatic theory. Theoretical results are supported by carefully chosen examples and analogies, allowing students to intuitively discover meaning for themselves.